Pl. XXXV. 130. 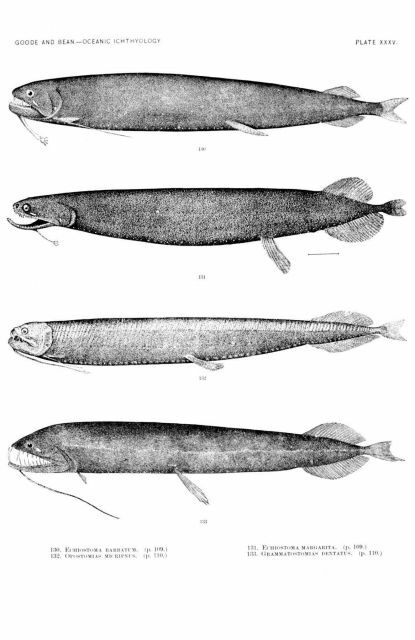 Echiostoma barbatum, Lowe. From N. Lat. 39.2, W. Lon. 72.1, at 636 fathoms. 131. Echiostoma margarita, Goode and Bean. From N. Lat. 28.6, W. Lon. 87.0, at 420 fathoms. 132. Opostomias micripnus, Gunther. From Gunther, Challenger Report, Vol. XXII. 133. Grammatostomias dentatus, Goode and Bean. From N. Lat. 38.3, W. Lon. 69.0, at 2069 fathoms.